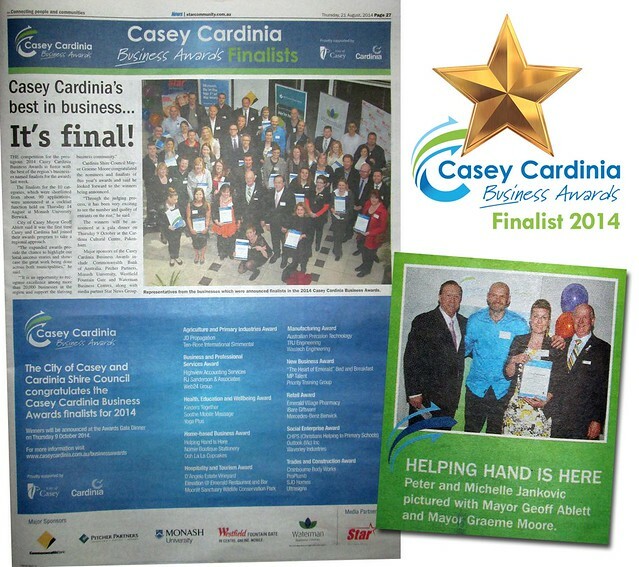 Casey Cardinia’s best in business… It’s final! The competition for the prestigious 2014 Casey Cardinia Business Award is fierce with the best of the region’s businesses named finalists for the awards last week. The finalists for the 10 categories, which were shortlisted from about 90 applications, were announced at a cocktail function held on Thursday 14 August at Monash University Berwick. Cardinia Shire Council Mayor Graeme Moore congratulated the nominees and finalists of this year’s awards and said he looked forward to the winners being announced. “Through the judging process, it has been very exciting to see the number and quantity of entrants on the rise,” he said. The winners will be announced at a gala dinner on Thursday 9 October at the Cardinia Cultural Centre, Pakenham. Major sponsors of the Casey Cardinia Business Awards include Commonwealth Bank of Australia, Pitcher Partners, Monash University, Westfield Fountain Gate and Waterman Business Centres, along with media partner Star News Group.